Pyro Guy Peak is the sixth level of World 6 found in Yoshi's New Island. 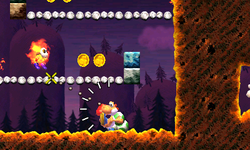 Yoshi starts the level in a lava-themed area with some moving platforms and enemies, with a pipe leading Yoshi to an area with more enemies and the Checkpoint Ring. Another pipe takes Yoshi back outside to an area with bouncing Pyro Guys, some spawning out of pipes. Eventually, Yoshi reaches the Goal Ring.